Before Nintendo shut down Miiverse, users were able to submit requests for their post history. Fans were told that archives would be sent out containing all the posts they made up to the day of the closure. Emails are now starting to go out containing the entire post history. It should come with all drawings and whatever else you posted on Miiverse. Just keep in mind that you’ll need to access the download link included with your email before the year ends. It’s that time as Nintendo has officially ended Miiverse’s services on 3DS & Wii U. 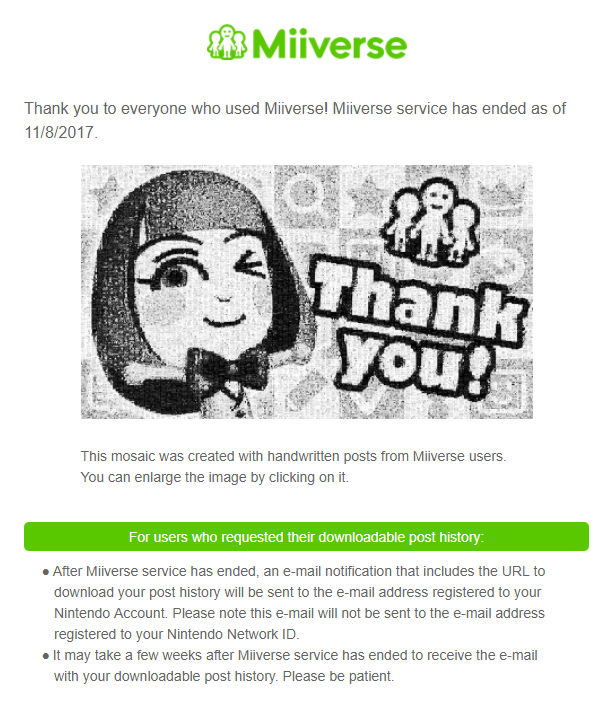 As of now if you try to connect to Miiverse, you will get a server error saying that the service has ended. The homepage for the official Miiverse website shows this image below basically saying the same thing about the end of Miiverse and also information about how your downloadable post history will be sent to your email if you sent a request. As of right now, Nintendo has no plans for a new social media service on the Switch to replace Miiverse but these last 5 years of Miiverse were something special. Thank you Miiverse and goodbye. 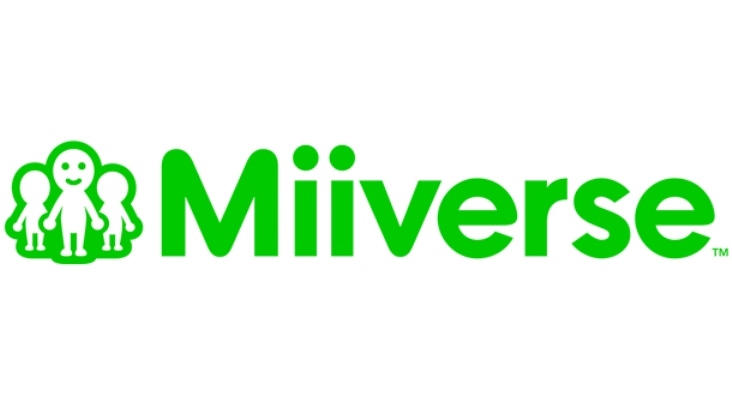 Miiverse will be shutting down later this month. 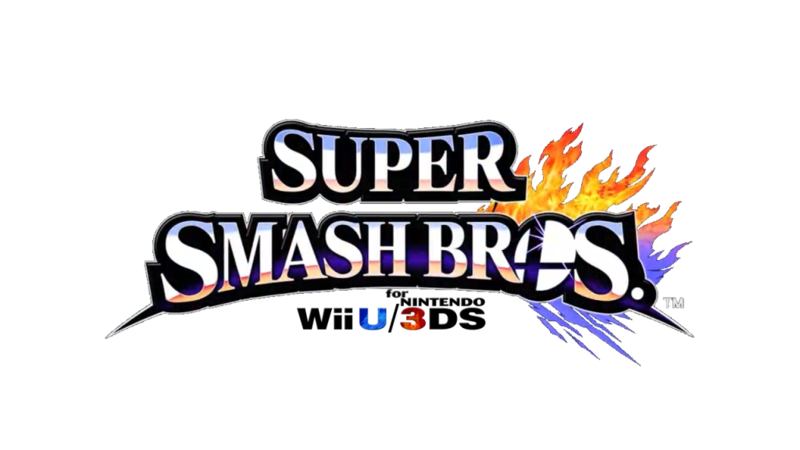 Its closure will have an impact on Super Smash Bros. for Wii U/3DS, with the Wii U version in particular being affected. Nintendo is closing down Miiverse next month. But before it ended, a special “Everybody’s Message” community opened where users could share some of their last drawings. 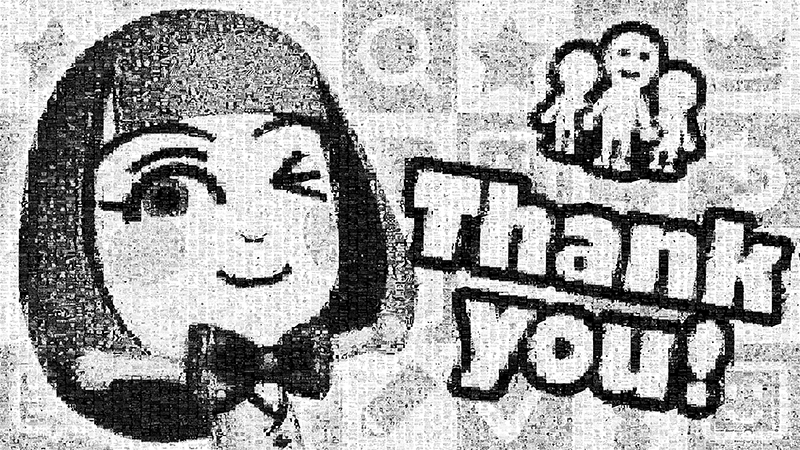 Nintendo collected some of the images that Miiverse visitors created and made a special collage out of it all. The official announcement about the collage, as well as a link to the full-sized version, can be found below. Thanks to Justin and Sidney Eng for the tip. The end of Miiverse is almost upon us. Towards the beginning of November, the service is shutting down. All posts and everything else associated with the social network will be wiped clean. To celebrate all of the good memories on Miiverse, a number of Nintendo developers have contributed special drawings that have been shared over the past several days. Shigeru Miyamoto, Eijo Aonuma, and Takashi Tezuka are just a few who created art for the community. The end of Miiverse isn’t too far away. Nintendo will be closing the social community permanently during the evening of November 7 / very early morning of November 8. Ahead of the big move, a special community has opened on Miiverse. Members can partake in the “Everybody’s Message Community” until October 11. Here you can share your your Miiverse memories and shout-outs to other Miiverse users. Since it’s open to everyone worldwide, it’s only accepting hand-drawn posts. Nintendo also intends to make a collage out of a select number of posts at some point in the future. The end of Miiverse is quickly drawing near. Once November rolls in, the social networking service will be no more. A bunch of games will be impacted by its closure, but the community itself will also be shuttered. Nintendo is allowing members to save their own posts. Miiverse as we know it will be gone, however. So what will happen to all of the lovely artwork and user posts created over the years? Sadly, Miiverse is coming to an end soon. Nintendo announced earlier today that the service ends on November 7 / November 8, depending on where you live. So what about those who participated a ton in Miiverse? What will happen to everything posted on the social network? Well, the good news is that Nintendo has started up a tool that allows Miiverse users to submit a request for a file containing all posts and screenshots saved in your album. As long as you have a Nintendo Account and make the request before Miiverse ends, you should be good to go. Full details are on the official page here.